DPS-Promatic machines have proved popular in many countries around the world, in Europe, Asia, America, Africa and Australia. They appeal to most people and have become evergreens that do not go out of fashion. In this page you will find the answers to the most common problems. What are the best sites for DPS-Promatic coin-operated machines? 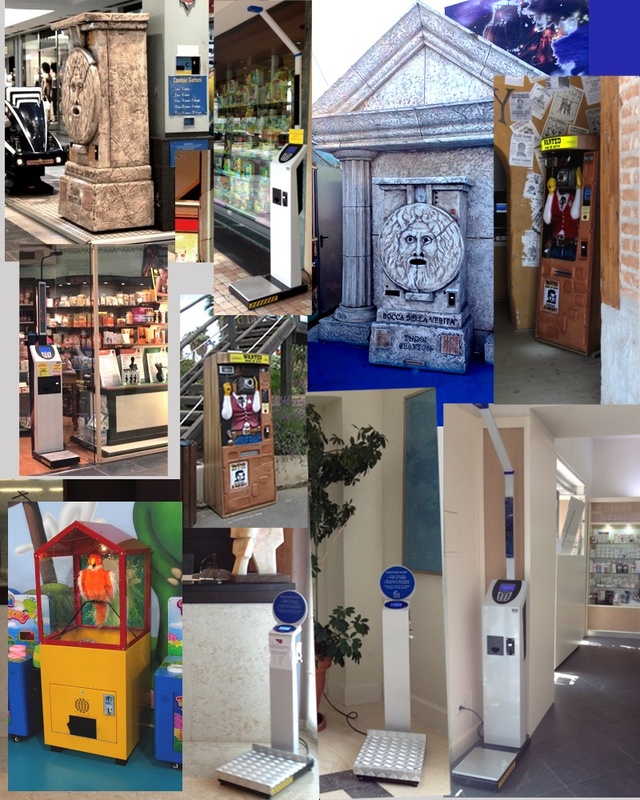 DPS-Promatic coin-operated machines are ideal for places where people are passing-by, without any hurry, maybe shopping or just walking for fun. Ideal locations are shopping centers or tourist promenades. The places to avoid are locations where people are loaded with bags or are in a hurry. Supermarkets where people go to buy food are usually not a good location. Usually people buy food always in a hurry and usually after the cashier they have bags, so places after the cashiers line are never a good place. In Italy we have plenty of ideal locations by the sea-side in the summer season, where people walk around enjoying an evening ice-cream. All our machines can be adapted to the coins and the voltages of any country. Our scales can weigh in Kg and Lb and measure height in cm and Ft and In. Our machines have been tested to work with power fluctuation and temperatures from 0 to 50 degrees. The Bocca della Verita' MAXIMA can stay outdoors. It is always better to put it under some protection. The Scales and the Testers cannot stay under the rain. They must be protected from it. They can stay in front of a shop, if there is something on the top of them to protect them from the rain. All of them work with coins but some of them could be converted to notes upon request. The Bocca della Verita' Maxima uses thermal paper rolls, about 90 meters long, 104 mm wide. The BWS-XB scales use thermal paper rolls, about 90 meters long, 57 mm wide. The Wanted machines use preprinted A4 paper upon which they print the picture with a laser printer. We can ship everywhere, by truck, sea or air. We have very good packing that guarantees the safety of your machine. In almost 30 years we had problems less than 10 times with thousands of shipments! Ask us an offer! Electronics nowadays is very reliable and, if broken, cannot be fixed locally but requires a change of the part. Our machines are not complicated and we can understand and ship you the part you need, that anybody with a little technical knowledge can put in place. Our machines have 1 year warranty. If you need any suggestion feel free to contact us, using the links at the top and bottom of the page.